Reinforcement learning, robotics, active learning and exploration. 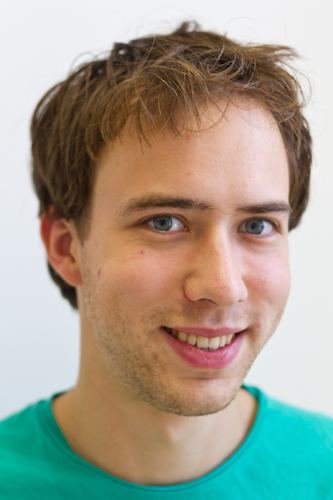 Herke van Hoof is currently a postdoctoral fellow at McGill University in Montreal, Canada. At McGill, Herke works with Professors Joelle Pineau, Dave Meger, and Gregory Dudek. Before that, Herke van Hoof obtained his PhD at the IAS lab under the supervision of Professor Jan Peters, where he graduated in November 2016. Herke works on machine learning for autonomous robots in perceptually challenging environments. For robots to master a wide array of tasks, machine learning is indispensable, but it is equally important that such tasks can be learned in non-standardized and unstructured environments such as homes or hospitals. Learning tasks in such complicated environment puts additional demands on algorithms for machine learning, perception, and control. One example of such a task is exploring the objects present in a novel environment. Segmenting objects using passive sensing is inherently limited. By interacting with the environment, the robot can improve its understanding of the different objects that are present. However, interaction is costly. By expressing the uncertainty in the robot's understanding of the world, it becomes possible to select actions based on the information they are expected to yield about the environment, and thus speed up the learning progress. In another project, we consider reinforcement learning with high-dimensional inputs. Current approaches have usually tried to learn features in a separate step. However, such features cannot be informed by what is relevant for the task at hand. We have taken a complementary approach, where we have developed a non-parametric reinforcement learning method that only depends on the similarity between data-points, independent of the embedding dimensionality. Before joining IAS, Herke got his bachelor and master degrees in Artificial Intelligence at the University of Groningen in the Netherlands. Within this degree, Herke focused on autonomous systems and perception, writing his bachelor thesis on "Using different methods to attract a robot's attention" under supervision of Gert Kootstra. During his master's, Herke got involved with RoboCup competitions, first in the 3D soccer simulation student team 'The little green BATS'. He proceeded to do an internship at INSERM in Lyon, France, where he participated in a RoboCup@Home team and worked on his master thesis on "Interaction between face detection and learning tracking systems" which explored ways to make different perception subsystems train each other to improve robot performance continuously. This work was done under the supervision of Tijn van der Zant, Peter Ford Dominey, and Marco Wiering. A full list of my publications can be found on this page. Herke's CV can be found here.